The Williamsburg Community Association runs a number of different community programs throughout the year and we want you to join! Have a look, sign up and we look forward to seeing you there. Please scroll down to see our current program listings. In addition to the information provided here, you can pick up a program flyer at the Williamsburg Community Centre or you can search Active Kitchener here. For the current Williamsburg Community Centre hours please click here. Children registered in the program must be program age by the first class. Participant instructor ratios are based on the ages of the children. Children under the required age cannot be permitted in the programs. Childcare is not provided during programs. All children under age 11 must be supervised while at the centre. You can come and visit us to register in person or you can register online. We’re located off Max Becker Drive on the 2nd floor underneath the clock tower, above the pub. All methods of payment are accepted. We take Debit, Credit, Cash, and Cheque. Please make cheques payable to the City of Kitchener, we do not accept post dated cheques. A 100% refund will be given if you withdraw from a program more than 7 days before the first day of the program. Please note: If credit is left on an account, the credit will expire after three years. NO REFUND will be given if a request to withdraw is made less than 7 days prior to the first day of the program. Please click here to read about these policies on the City of Kitchener website. Does The Williamsburg Community Association provide subsidy for programs? The Williamsburg Community Association fee subsidy must be arranged 2 weeks prior to the start of registration. Registration with a fee assistance voucher must be done in person at the Williamsburg Community Centre. 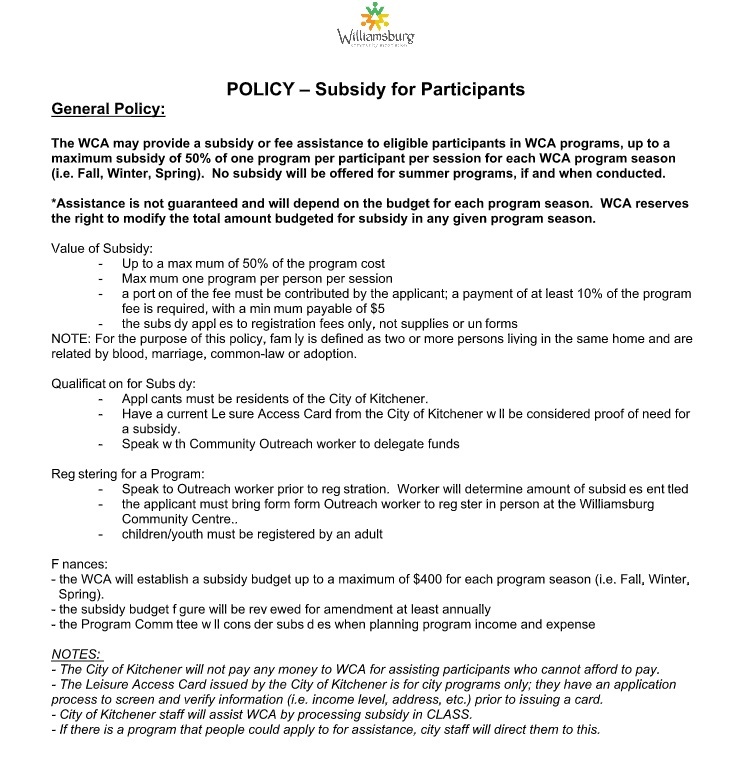 To qualify for The WCA fee subsidy you must be a Kitchener resident and approved by the City of Kitchener Active Kitchener Program. An access card must be shown as proof when applying for The WCA subsidy. Applications can be found online or you can visit the community centre to pick one up. Please allow sufficient time for the application to be processed. It may take up to two weeks to get your Leisure Access card in the mail. Winter Registration begins February 26th 8:30 a.m.